There are many themed iterations of a specific famous real estate baron board game, but very few of them involve the horrors of the Lovecraftian mythos descending upon South Jersey and destroying the boardwalk. 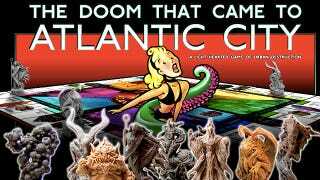 Behold The Doom That Came To Atlantic City, a satire by artist Lee Moyer, designer Keith Baker, and sculptor Paul Komoda (who worked on The Thing and Cabin in the Woods). This fun-for-all-ages destruction of reality — which has been in the works for two decades — was "inspired by [Moyer's] love of the Cthulhu Mythos and disdain for a certain board game that shall not be named." You begin with a happy community filled with houses, and then you and your friends arrive. Each of you is playing one of HP Lovecraft's Great Old Ones, and your goal is to smash houses, open gates, and destroy the world. But you each want to destroy it in your own special way. As Cthulhu, you want to make sure that pesky Shub-Niggurath doesn't sneak in and destroy it first! The idea of Azathoth the Blind Idiot God trashing Park Place is pretty fantastic. If you've always hankered to combine Yog Sothoth and seaside fun in the sun, you can pitch in at their Kickstarter campaign.